and positioning the ball in relation to the feet. A player stands with the feet pointing forward and approximately 150mm apart. The stick is held in the left hand and positioned with a straight arm so that the head rests on the ground in front of and between the feet. The stick-head is inclined to the left so that the face is angled at about 45° to the ground. In this position the left thumb will be pointing down the back side of the stick. Maintaining the left hand grip, the player squats as shown in the picture, so that the thighs are parallel to the ground and the buttocks are over the heels. The player should be comfortably balanced on the balls of the feet with the heels well off the ground. The left arm should now be bent and relaxed but free of the leg not resting on it, the forearm aligned with the handle. 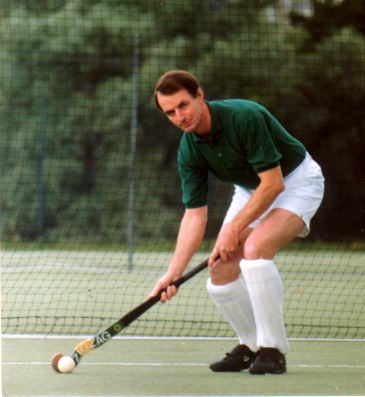 With the right arm almost touching the right thigh place the right forefinger down the back of the stick, the thumb on top and the remaining three fingers curled around the handle at what feels to be a comfortable distance from the stick-head. 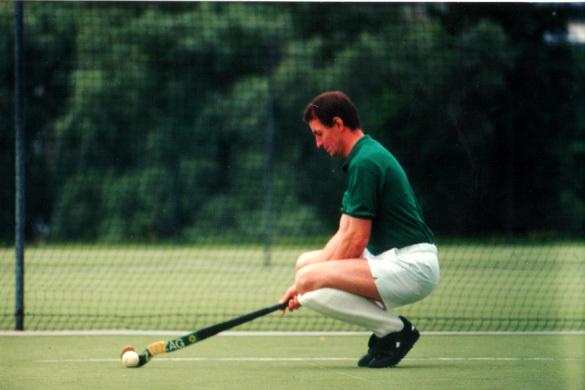 In this position rotate the stick-head over the ball and back again repeatedly without moving the ball. If this feels comfortable okay, if not adjust the position of the right hand, slightly up or down the stick, until the stick-head turning action is comfortable. Now start to move the ball from side to side as the stick-head is rotated over the ball. A movement of between 150mm and 200mm should be found to be at the limit of comfort especially as the speed at which the ball is moved is increased. There may be a tendency for the ball drift out of control towards the feet. If this happens the elbows will move out to cope with the shorter distance to the ball and stick-head and the player will tend to lose balance backwards. This can happen in a surprisingly short distance because both the feet and the arms are virtually pinned. 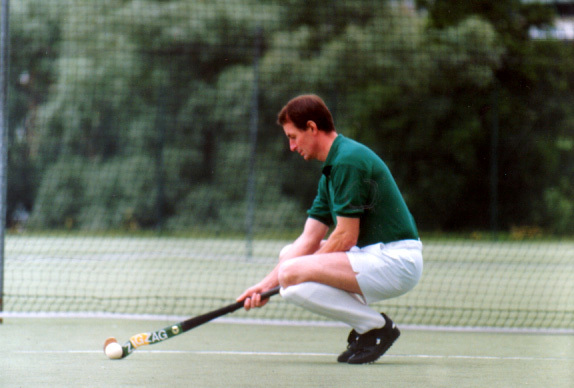 The feet and legs firmly by the ground and the squat position, the arms loosely by the grip on the stick and the distance at which the stick-head can be kept in comfortable contact with the ball. 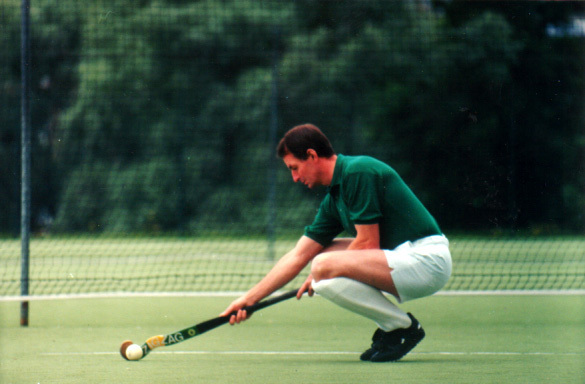 If the ball is moved towards the feet, even a little, the position becomes uncomfortable and uncontrollable because the grip position does not change and neither does the length of the stick. Moving the ball a short distance further away from the feet and trying to maintain the same grip position while rotating the stick-head over the ball has a similar but opposite effect. Again balance is lost or almost lost but this time it is lost forward and there will be an uncomfortable feeling of over reaching or even toppling. Going back to rotating the stick-head over and back the ball. Stop and leave the ball where it is and move the right hand down the stick so that it is closer to the ball, 100mm will be sufficient. There will immediately be the same lost of balance and feeling of overreaching that was experienced when the ball was moved a similar distance away from the feet. Leaving the ball in position and moving the hands up the stick pushes both elbows out and the back arches as the player attempt to maintain balance. What all this means is that the distance of the ball from the feet is critical and the place at which the right hand grips the stick is also critical. The position of the third finger of the right hand when the right hand position on the stick handle is optimal should be noted and marked with tape. This position has been found by reducing the number of distance variables or reducing the influence of them. 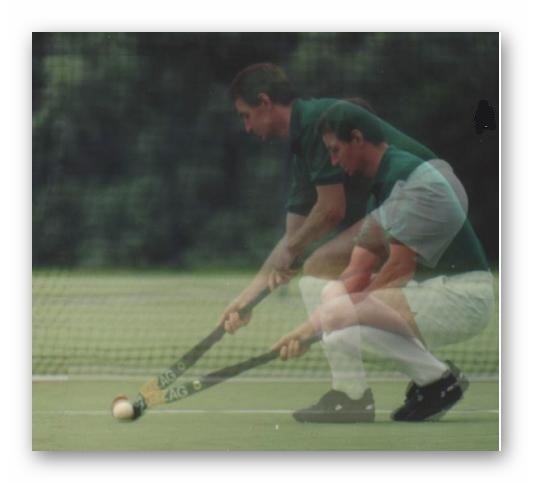 The legs were taken out of consideration and the influence on distance adjustment of the arms and changes to the length of the stick caused by changes of angle much reduced. Some of these influences can be huge (legs, arms) others marginal (stick angle, bend to body), all are significant especially distance of the ball from the feet, even if any change made is quite small. Having established a right hand grip position the legs can be released, the player should move up into a dribbling crouch. Moving more upright will elevate the stick and reduce horizontal reach and this has to be compensated for. 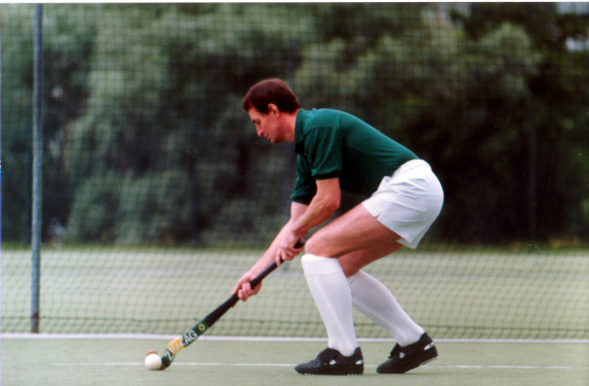 (It should be noted that the angle of the stick is nowhere near perpendicular to the ground when in a dribbling crouch, it is closer to the angle it was in while squatting). One foot, it does not matter which, can be advanced about half its own length (but no more than that, less if a ball playing position that feels comfortable can be maintained). It is important that the maximum distance possible, while still maintaining close control, is kept between the feet and the ball. The distance may seen unusual especially if the player has previously played with a straight leg stance and with the ball close to the feet but it is worth persevering with, even it does at first feel odd. Now the player can look up and beyond the ball and see the ball only in peripheral vision while moving with it and rotating the stick-head over and back the top of it. Practice, practice, practice around objects large and small – look to the next object not at the ball. Keep refreshing the hand positioning by squatting, at first every minute or so, until holding a stick in this position is ‘grooved in’ and become habit. A tape ridge on the handle is a good ‘reminder’ for the right hand. The next stage is pulling the ball back and taking the stick-head around the back of it, then moving forward in a different direction. I put together this sequence of photographed poses when I was 47 years old. I felt at the time I first looked at them that I was getting fat. I am 73 now and my prediction has become truth.